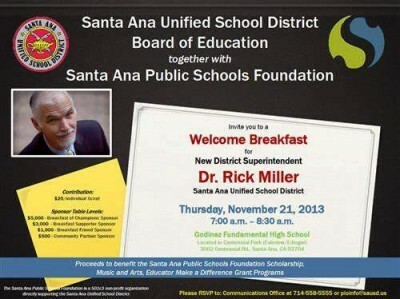 THE EVENT: Santa Ana Unified School District Board of Education together with Santa Ana Public Schools Foundation are holding a Welcome Breakfast for New District Superintendent Dr. Rick Miller. The event will take place on Thursday, November 21, 2013 from 7:00 a.m. – 8:30 a.m. at Godinez Fundamental High School. Proceeds from this event are to benefit the SAPSF Scholarship fund, music and art programs, and the Educator Make a Difference Grant programs. Please post on your community calendar and consider providing coverage for this community event that will bring state, county, and city elected officials and business and community leaders of Orange County together to support the students and staff of the Santa Ana Unified School District community. WHEN: Thursday, November 21, 2013, at 7:00 a.m.
§ Special greetings from high school mascots, choirs and school bands. (714) 558-5555 desk or (714) 673-4995 cell.